Talking with Hailey resident Jon Marvel early last week about the huge Elk Creek and Pony wildfires blazing northeast of Boise, Idaho, he said “Watch the Beaver Creek Fire, especially as the weekend arrives.” The weekend came with the predicted winds and a stampeding wildlife of 93,000 acres! Weather forecast for 8/20 and later- Forecast high is 86 degrees, the same as yesterday. No storms are predicted. Winds are predicted to be slightly calmer at 5-10 mph. The low on Tuesday night-Wednesday morning is predicted to be 39 degrees. It is getting cold, good news for fighting the fire. However, thunderstorms (40%) of precipitation are predicted on Wednesday. Update at the end of 8/19/13. The fire is now approximately 105-thousand acres in perimeter size and 10 percent contained. The fire burned hard in the top of Deer Creek on 8/19, but that is in the backcountry. The resort towns of Hailey and Ketchum had a near miss back in 2007 in the big Castle Rock Fire. 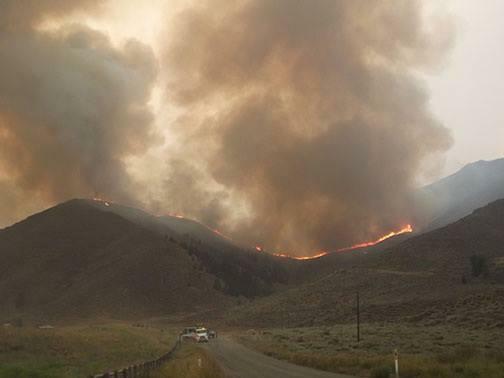 The scar of that five-year-old burn is presently keeping the Beaver Creek fire at bay near part of Ketchum/Sun Valley which lies about ten miles north of Hailey. The biggest threat his been to the developments just a few miles north of Hailey. The Wood River Valley has some very high end real estate. Many of these are a few miles north of Hailey. There are also many residents with modest homes throughout the Valley, especially as you go southward. Detailed information on the fire burning now burning right on the edge of Hailey and especially, just north between Hailey and Ketchum is now given in detail at this page from the Blaine County Sheriffs Department. Beaver Creek Fire in Deer Creek near Clarendon Hot Springs. The smoke plume has traveled quite far and is pretty dense over the Madison Valley in Montana, seems to come in waves. It’s less dense this evening than it was most of the day but a thin layer of ash covers everything. Whether the ash is from the Eureka fire or the Beaver fire in Ketchum/Hailey area is not known but most likely the majority of the smoke plume is from the Idaho fire. It has been one of the lead stories on NPR today morning and evening. I hope it can be contained soon but it’s not looking good on that concern at the moment. Wunderground has a good mapping page for fires and includes smoke plume coverage, looking at that it’s easy to see where our local smoke haze is coming from. My heart goes out to everyone in Ketchum, Sun Valley and Hailey and I pray that lives are not lost in this time of severe fires. I spent many holidays in this area in the 90′ and met so many wonderful people that love and respect this beautiful area of America. God bless all the fire fighters and residents and keep all safe. Salle our job site was only four miles from the eureka fire. On Monday it was only at 200 acres and they said it was contained until high winds moved in and its now at or above 2400 acres and in heave dead timber. I would say the majority of smoke is from the eureka fire in the Madison valley. I notice Inciweb says it will be a “long term event.” I guess then a strong probability the top of the Gravelies with all that dead, and most explosive, mixed green, dying and dead timber will burn with runs down into the side canyons. Although Hailey is close to Ketchum and Sun Valley we should be safe here. The airport will be protected because of the many expensive corporate aircraft there.